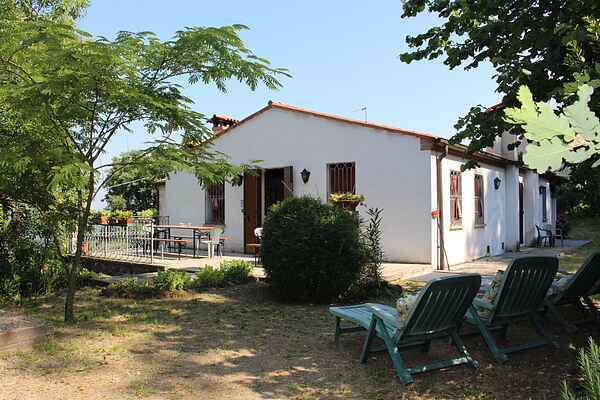 This comfortable country house for holidays is peaceful surrounded by the green hills of the Regional Park Colli Euganei and is located in Cinto Euganeo (province of Padua). It is divided into 3 accommodations and surrounded by a big garden (500 square meters) and situated on a estate of 2 hectares with a forest and lots of fruit trees, with a view over the picturesque hills. The house borders along that of the hospitable owner. On request, you can use the cosy stone oven to e.g. organize a BBQ. In front of the house there is a terrace equipped with tables and chairs, it is ideal for the outdoor dining. In the surrounding: het thermal-area famous for their mud-bath treatments and swimming pools (Abano, Montegrotto, Battaglia) within 13 km, the medieval hamlets of Arquà Petrarca and Este (monumental towns) within 6 km, Padova within 29 km, Vicenza within 38 km. further: Venice and the Garda lake within 1,5 hrs. drive. The owner will gladly advise on events, monuments, festivals, fairs and sports possibilities in the area. Get to Venice in less than one hour,even by train ... Most important EVENTS: * June Abano Terme International Horse Race * All of August and the first Sundays of September MONTAGNANA PALIO DEI 10 COMUNI - historic commemoration of the town liberation from the tyrant Ezzelino da Romano. * Second and third Sundays of September at Monselice GIOSTRA DELLA ROCCA competition of 9 contradas and prize giving of the Joust Palio * First and second Sundays of October Arquà Petrarca Festival of Jujuges, medieval parades and flag weavers across the downtown streets. SPORT ACTIVITIES The Euganean Hills are the ideal place for any outdoors sports, such as Jogging, Trekking, Mountain biking and horse trekking ( addresses of riding schools on the information page). The environment characteristics, woods, paths, ways and climbing walls (Rocca Pendice), make this place a paradise for those who love nature and want to spend some time surrounded by greenery. Euganean territory is specialized in GOLF as well; there are 5 golf courses: Golf club Padova (18 holes) at Valsanzibio, Golf Club Frassanelle (18 holes), Golf Club at Montecchia (27 holes), Golf Club Galzignano (9 holes), Colf Club Colli Euganei at Monteortone (Driving Range- Training course). Different levelled training courses are held at Montecchia by the Accademia del Golf.